Greece has been rocked by protests as the government struggles to come up with ways to cut deficits and secure more emergency funding. NEW YORK (CNNMoney) -- Greek finance officials are expected to carry on further discussions with the nation's bailout providers after two days of conference calls aimed at securing urgently needed funding. Evangelos Venizelos, the Greek finance minister, carried on two days of conference calls with the International Monetary Fund, European Council and European Central Bank. Venizelos called Monday's conference call "productive." Discussions are expected to continue among officials over the weekend in Washington, D.C., where the IMF is holding its fall meeting. And the so-called troika is expected to return to Athens next week. The talks come at a crucial time for Greece, which will run short of the cash it needs to pay all of its bills next month without more bailout money. The main concern is that a default by Greece will drag down other European economies that are struggling with weak growth and unsustainable levels of debt. 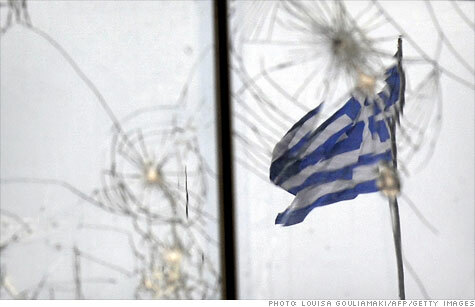 The banking system in Europe is also considered vulnerable to failures if Greece were to go bust in dramatic fashion. At issue are certain reforms Greece agreed to make under the terms of the €110 billion bailout it received last year from the IMF, EC and ECB. The Greek government has been struggling to agree on painful budget cuts, including layoffs and tax increases, in order to qualify for the sixth installment of its bailout, worth about €8 billion. "We still think the troika is most likely to provide the next disbursement," said Peter Westaway, chief of European Economics at Nomura Securities, in a report. "But even if Greece does not fall short this month, the same issue is likely to arise in December when the next disbursement is due." Greece has flirted with the default line before. The country was snatched from the jaws of default in July by the promise of a second €109 billion rescue. But the additional funding must be approved by the individual governments of all 17 nations that use the euro. In the meantime, Greece must convince the troika that it will make the cuts necessary to meet its fiscal targets. "The government will still find it extremely difficult to galvanize support for fresh austerity measures given the degree of popular resentment and there were persistent expectations of an eventual default," currency strategists at Sucden Financial wrote in a report. Greece is in the midst of a deep recession and some economists argue that a so-called structured default may be the only way for the nation to resolve its money problems in the long-run. Under that scenario, countries would have a plan in place and there would likely be statements from European leaders ahead of any official default. But even a controlled default could have unpredictable consequences for the European economy and could shock the global financial system. "The reality is that if financing were to be withdrawn, Greece would default on its debt and declare a moratorium on future debt payments, leading to an eventual significant haircut," said Westway. That would cause Greek banks to "implode" and could result in a government shutdown in Athens, he added. Wishing for euro bonds? Fat chance. The potential for an all-out collapse by Greece has driven speculation that the eurozone may not survive the current crisis in its current form. The fear is that either weak members of the currency union will go bankrupt and be forced out, or stronger members will become unwilling to continue propping up fiscally challenged neighbors and strike out on their own. "All told, it is easy to see how speculation on other countries leaving the union could turn this into a self-fulfilling prophecy, potentially leading us to hear the death rattle of the euro area itself," said Westway. Despite the still uncertain outlook for Greece, investors took some solace that the "productive" talks were ongoing. In addition, government bond auctions in Greece and Spain drew strong results Tuesday. That helped offset worries about a downgrade of Italy's credit rating by Standard & Poor's. Stock markets in London (UKX), Frankfurt (DAX) and Paris (CAC40) were up between 1% and 2%. The euro regained ground against the U.S. dollar in the currency market.